Treasured buttons are delightfully displayed in this unique bracelet. There is no need to remove shanks. 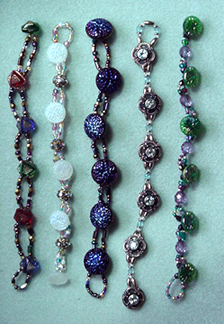 The buttons remain intact so even collectables can be fashioned into the bracelet. This technique also allows disassembly of the bracelet at a later date without damage to vintage or heirloom buttons.